NEW YORK (CNS) — Considered strictly as a work of literature, few volumes can rival the Bible for high-stakes drama, intriguing characters, tumultuous action and sheer spectacle. So it’s no surprise that Hollywood turned to the Good Book early on — director Sidney Olcott’s short film “David and Goliath,” for example, was released in 1908 — or that Scripture-based stories remained a big-screen fixture well into the 1960s. 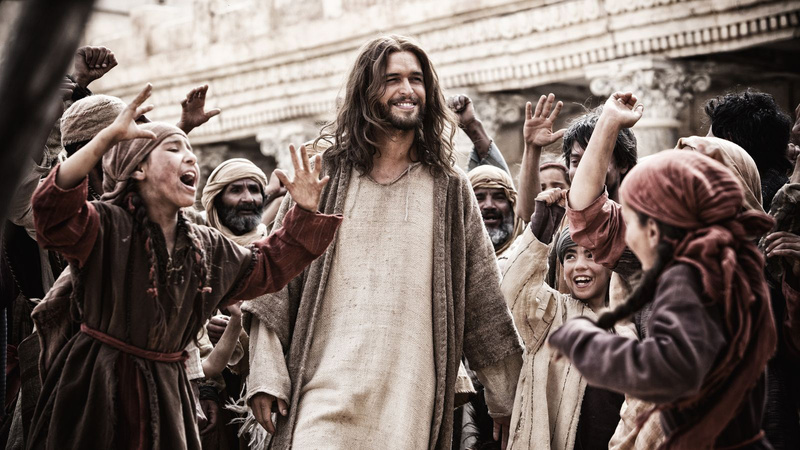 Television has also seen its fair share of Bible adaptations. In fact, Franco Zeffirelli’s 1977 miniseries “Jesus of Nazareth” — co-written primarily with Catholic-reared novelist Anthony Burgess and celebrated Italian screenwriter Suso Cecchi d’Amico — is arguably superior to any cinematic treatment of its sacred subject. It aired on ITV in Britain and on NBC in the United States. The latest small-screen offering in the genre is the History cable channel’s 10-hour miniseries “The Bible.” Created by the husband-and-wife team of Mark Burnett and Roma Downey, and narrated by Keith David — who has narrated many Ken Burns documentaries — this survey of salvation history from Genesis to Revelation premieres with back-to-back episodes Sunday, March 3, 8-10 p.m. EST. Even with such a large canvas to fill, considerable compression is needed to encompass the many centuries that separate the Garden of Eden from St. John’s vision of the end times. This becomes obvious right at the start as the story of creation and the fall of Adam and Eve are recounted by Noah to his companions in the already storm-tossed ark. It’s a reasonably deft solution, and sets the brisk pace that will carry the audience, by the end of the second episode screened, through the Exodus and on to Joshua’s (Andrew Scarborough) siege of Jericho. Among the early passages dramatized, two stand out as highlights: Abraham’s (Gary Oliver) interaction with his sons and Moses’ (William Houston) parting of the Red Sea. Both Ishmael’s exile and the preparations for the sacrifice of Isaac (Hugo Rossi) are poignant, while the computer-generated imagery used to recreate the separation of the waters represents technical wizardry at its best. Along with the impressive special effects, the script manages to make the Egyptians’ pursuit of the escaping Israelites feel like a genuine cliffhanger. Whether in the interests of family-friendly viewing or political correctness, the goings-on at Sodom are sanitized to make it seem that the locals are macho warriors looking to kill Lot’s (Antonio Magro) angelic guests rather than abuse them. While there’s little, overall, of concern in the portrayal of sexuality — one character does insult a woman by calling her a “whore” — violence is another matter. A good deal of screen time is devoted to combat and, while much of it is stylized, there is some brutality and gore. Parents will have to assess whether children old enough to benefit from this shortcut to biblical literacy will also be able to take such mayhem in stride. Beyond introducing stories with which every well-educated adult should be familiar, will “The Bible” serve to awaken or enhance viewers’ faith? Devotion to the will of God is certainly the underlying motivation for all the major characters. But, as many of the Scripture-themed features of yesteryear demonstrate, faith is among the more difficult aspects of the human experiences to portray. The sheer gravity of the test to which Abraham is subjected makes his unlimited trust in God clear. But at other times “The Bible” seems more focused on swords and sandals than on souls. Perhaps the later episodes devoted to the person of Jesus can be expected to shift the emphasis and convey a keener sense of the divine presence. Back-to-back installments of “The Bible” continue Sundays through Easter, March 31, 8-10 p.m. EDT each night. PREVIOUS: “The Good Pope: The Making of a Saint and the Remaking of the Church — The Story of John XXIII and Vatican II” by Greg Tobin. Why is there no cast list other than a sparce, somewhat jumbled affair on Wiki or IMDB? It would be very interesting for some of us at least to see who these actors are/.